There's excellent music choice. As tiny flickering lanterns, held one to a finger, are drawn sinuously through the air like the carriages of a train or the body of a lighted serpent: a French chanteuse, a singer in the night. As an errant ball travels invisible paths connecting a conjurer's sleeve to his battered hat: a middle-century jazz track pushing out waves of disharmony – the sort of music that plays in a noir film when the private detective's drink has been spiked with psychotropics and his ghastly, sweating face is overlaid with scenes of the moving city. As three heavy shots (3kg, 5kg and 8kg) are muscled overhead, thrown and caught: Chesney Hawkes, The One and Only. For Jani Nuutinen's solo show, the second in what will eventually be a trilogy, the stage is a beautiful collar of wood circling a metal hub, the audience seated in the round. Vertical poles, positioned at intervals along the circumference, support a white veil onto which shadows are thrown – a train, a boat; later, the bars of a cage and the silhouettes of circus animals within. Lights are hoisted and dropped by a low-tech, unoiled winch; equipment is dragged roughly around. Everything is there when we enter, and still there when we leave; it is all handmade by Jani himself. Inviting us into this new circus, almost into his home, Jani is suave and confident, unexpectedly dignified (in the face of Chesney Hawkes), a little odd and dark, practically-minded, well-mannered: Finnish, perhaps. Removing the poles from the edge of the stage and balancing them on his body in interlocking matrices he's the gondolier of another world, your companion and your guide. But in spite of Jani's presence and unaffected charm, Un Cirque Plus Juste, essentially a collection of performance vignettes, ultimately feels a little self-centred. 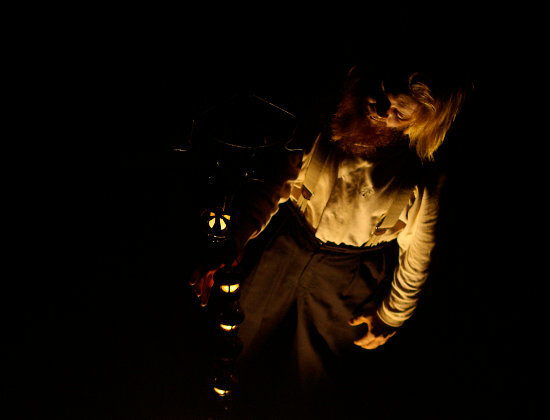 Taking one of the old spotlights in his hands, Jani tracks it slowly over his spectators, blinding a portion of the audience while revealing them to the remainder, but this – like the moment at the end when Jani takes a seat with the audience – comes across as shallow in gesturing towards a close relationship and intimacy which is only intermittently allowed to control the piece. I was told the show usually plays within a tent that Jani has himself designed and built, and perhaps there it would find its binding energy. It certainly seems like some of the shadowplay and lighting would be more effective in the intended setting, but also it's a piece that positions itself in relation to the traditional circus – the tent and its associations are a vital coordinate and a part of the game. In the drab, brick-walled basement of the Roundhouse Studio the strongest elements were the least delicate, the least intimate, the least true to the ambitions of the piece and its charismatic, unusual performer. For more on Circo Aereo see their interview and profile in the book Panorama contemporain des arts du cirque. The company are also featured on the double-DVD compilation Le Nuancier du Cirque.